An old 18th century farmhouse rehabilitated into a 4-star luxury hotel, "La Dimora" welcomes you in its 17 elegant rooms and suites. 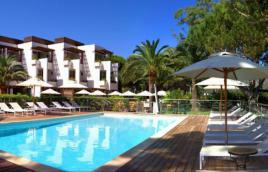 It is situated a few minutes away from the idyllic beaches of the Agriate desert and Saint Florent's port. The "Pera Bianca" pool-house in our ancient cottages, invites you to take a refreshment or to savour a delicious menu with a wide range of local products. Wooded property and her heated swimming pool, invites you in the relaxed rhythm of life.